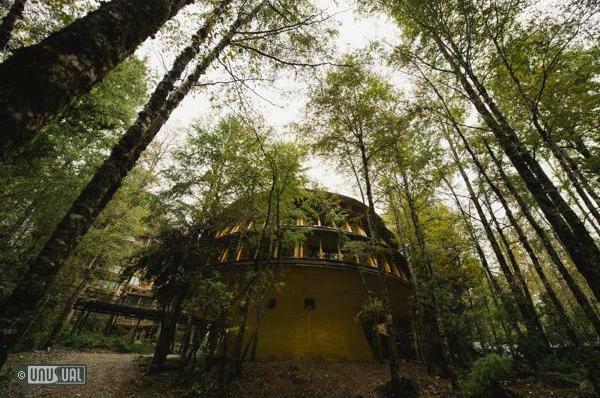 Reino Fungi Lodge maintains the same ethnic surrealist architectural style as Nothofagus Hotel & Spa and Montaña Mágica Lodge, taking the form of a 3-story giant mushroom, hence the Mushroom Kingdom Lodge name. Built of tubular steel with double-T beams and diagonals, there are rooms on each floor, connected to a convention hall by ramps. 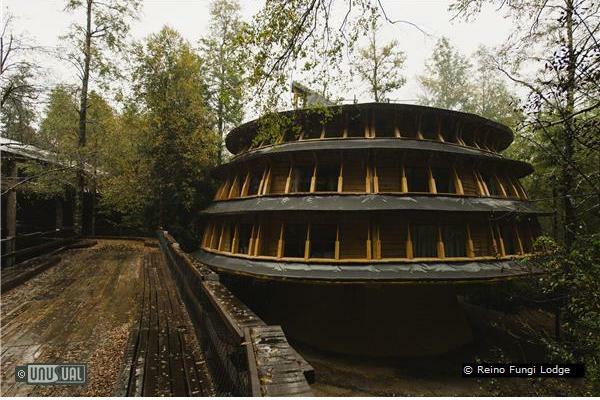 It is directly connected to the Lawenko Spa and perfect for relaxation or as a base for river and forest walking activities in the summer, and winter ski or snowshoe trekking. 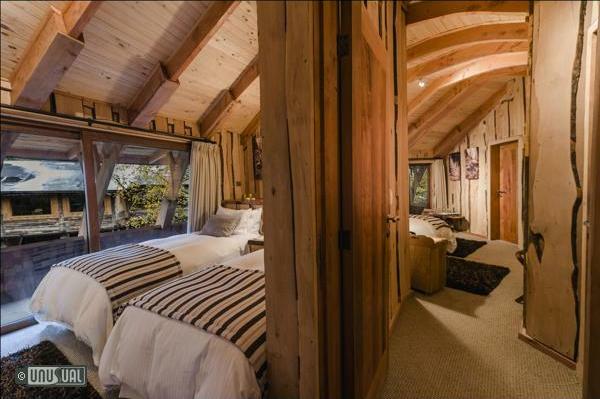 A giant woodland mushroom to sleep in! 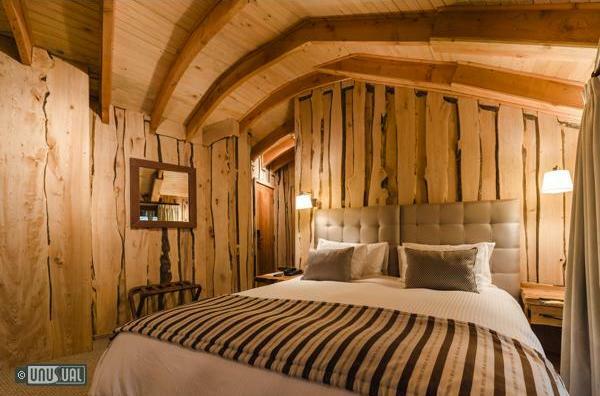 Reino Fungi has 22 rooms with Italian beds from Standard to Superior, with the choice between a full-size or twin-size bed. An additional bed is allowed in the Superior Rooms. 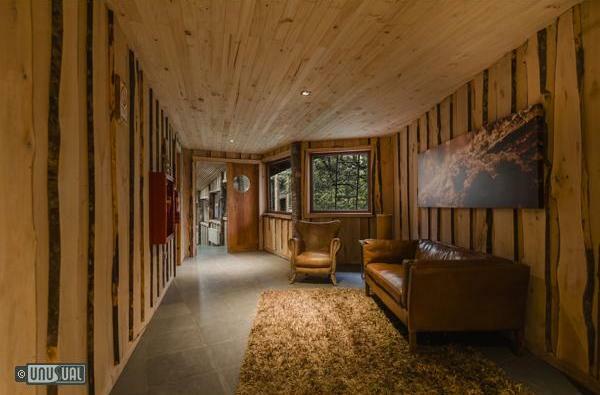 They all additionally have a private covered balcony and connecting rooms. There is also an upper level for public use and two meeting rooms. Inside the building there is a central space with a chandelier and an open area with an Oak tree in the middle whose highest point surpasses the height of the building. 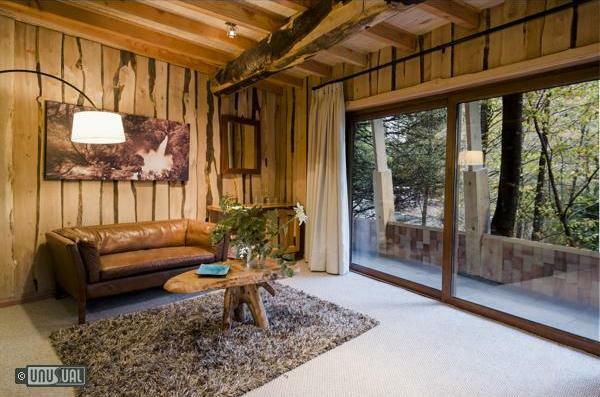 Through the interior windows made by this space, you can see water trickling down rocks and native vegetation, as well as the natural light that illuminates the central hall connecting the rooms. 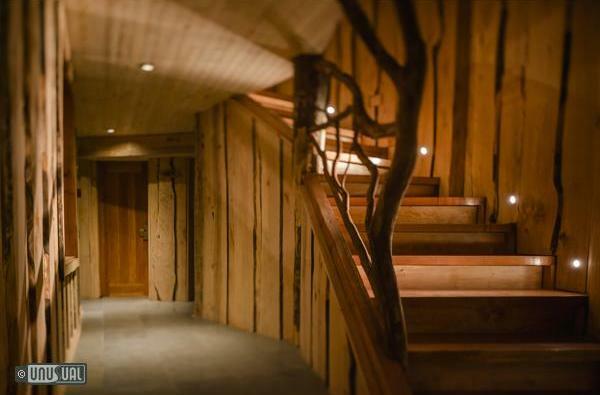 The guest registry and reception are found in the main entry of Nothofagus Hotel & Spa, which internally connects to Reino Fungi via two elevated walkways and one outdoor walkway. Located in the main building, Nothofagus Hotel & Spa, the restaurant offers a fusion of local/international food, with a variety of regional products. There are two choices suggested by the chef offered daily, with different alternatives for the lunch and dinner service. Additionally, they have alternating dishes that make up the menu’s starters, main dishes and desserts. The Bar, located next to the Restaurant, has a wide variety of juices, soft drinks and drinks to enjoy, in addition to the selection of national and vintage wines. 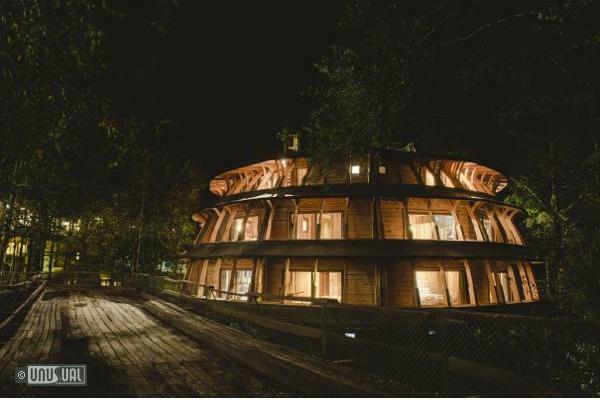 Located alongside Hotel Nothfagus and in front of Reino Fungi, it has an indoor heated pool and an ambient temperature outdoor pool, two hot tubs, wet and dry sauna, relaxation room and massage services; a visit to Lawenko Spa is without a doubt the perfect way to recover after a day outdoors. 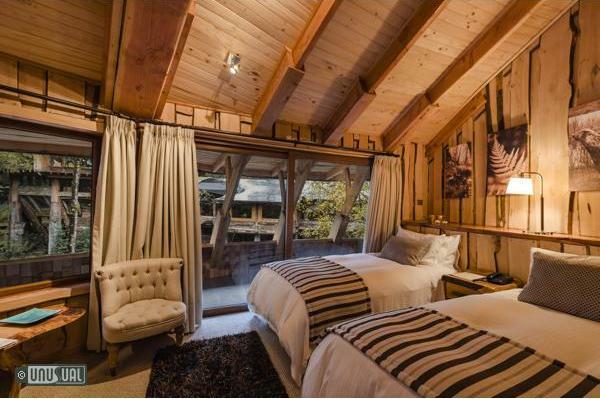 The Lodge is 35 miles (60km) from Panguipulli, the nearest town. 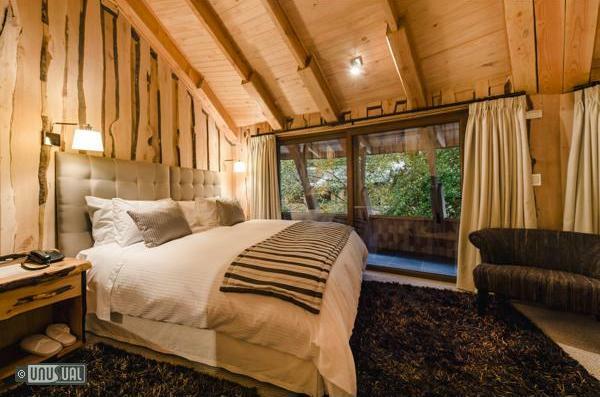 The largest major city is Valdivia, around 80 miles (165km) from the resort. 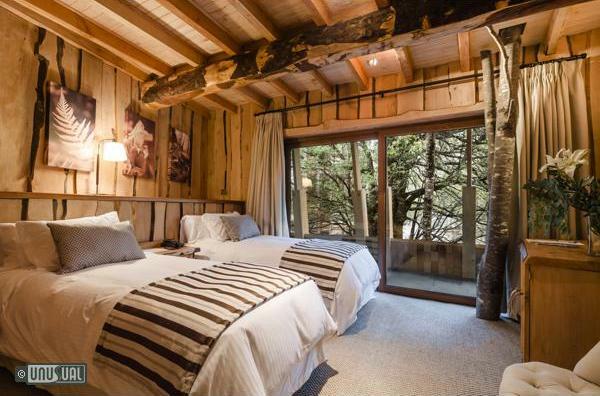 The main airport is in Temuco, 85 miles (180km) away – around 3 hours from Huilo Huilo. Hire a car from the airport or arrange a transfer with the resort. Reino Fungi has a program of more than 40 different expeditions, such as: Trekking, Canopying, Horseback Riding, Mountain Biking, Vehicle Expeditions, Kayaking, Sailing on Lake Pirehueico, Mountain Expeditions, Snow Adventures, Fly Fishing and Hot Springs, all carried out by operators from the nearby community who have been trained to perform these activities which are coordinated in our Excursion Center. Just to let to know that the eruption of Puyehue Volcano is not affecting Hotel Antumalal, nor Temuco Airport or the close ski area at Villarrica Volcano (actually the whole Argentinean Patagonia and even Buenos Aires are under ashes!!! ).